I’m no master chef, by any means. If I cooked it was always because I needed to, not because I wanted to. But after experiencing my first Crohn’s Disease flare-up last year I decided to finally take control of my eating habits and spend more time in the kitchen. I’m unable to spend too much time preparing meals due to my busy schedule, so my oven has become my best friend. There are so many quick and healthy meals you can prepare and then easily pop in the oven to work its magic. I reached out to my friends at Trudeau (a fourth generation family operated company who’ve been the leading supplier of kitchenware and tabletop accessories for an incredible 125 years here in North America) for baking inspiration because their new “Freshly Baked” collection caught my eye. Super cute with fashion two-tone finishes (loving the Grey and Deep Fuchsia combination), Trudeau’s new collection includes all the necessary tools and gadgets to assist at-home bakers like myself prepare sweet and savory mouth-watering treats with ease and efficiency. 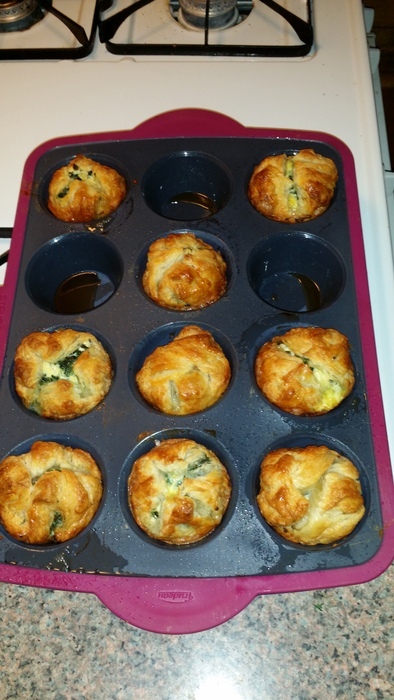 I decided to rock with a savory recipe that reflects my heritage (Middle Eastern/Mediterranean) to test out my goodies for the first time, so I visited BonAppetit.com and chose their “Spinach Puffs” recipe. I’d never made anything with puff pastry before so I was definitely prepared for the worst, not to mention when I felt Trudeau’s new muffin tin I realized its silicone flexibility was super soft (it feels rubbery and a little weird) so I freaked out. After a few deep breaths I got right to it and was literally jumping for joy when 30 minutes later I pulled these babies out the oven and they not only looked half decent, they tasted incredible! As for Trudeau’s utensils, I used their Silicone Muffin Pan, Adjustable Pastry Wheel and Pastry Mat. Check the recipe below. Cut puff pastry into 3 equal strips. Reserve 1 strip for another use. Cut each remaining strip into 3 squares for a total of 6. Place a square in each muffin cup, pressing into bottom and up sides and leaving corners pointing up. Divide filling among cups. Fold pastry over filling, pressing corners together to meet in center. Preheat oven to 400°. Beat remaining egg to blend in a small bowl. Brush pastry with egg wash (this will give the pastry a nice sheen). Bake until pastry is golden brown and puffed, about 25 minutes. Transfer to a wire rack; let puffs cool in pan for 10 minutes. Run a sharp paring knife around pan edges to loosen; turn out puffs onto rack to cool slightly before serving.